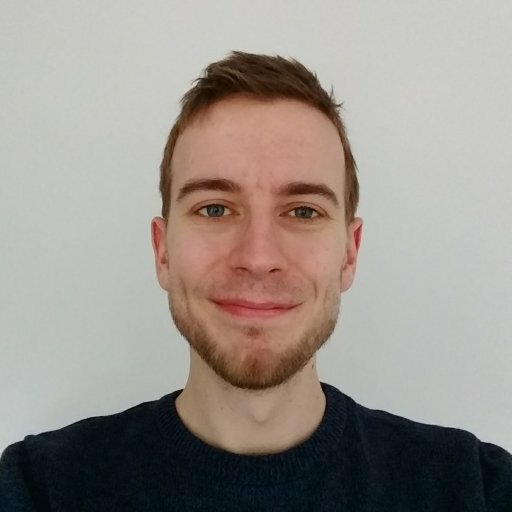 There are plenty of big baddies in Sekiro: Shadows Die Twice, but one of the most commonly recurring antagonists you’ll face is the Giant Snake. Officially named the Great Serpent, this beast is a terrifying adversary that must be snuck past repeatedly, avoiding its gaze as you find a path to safety. 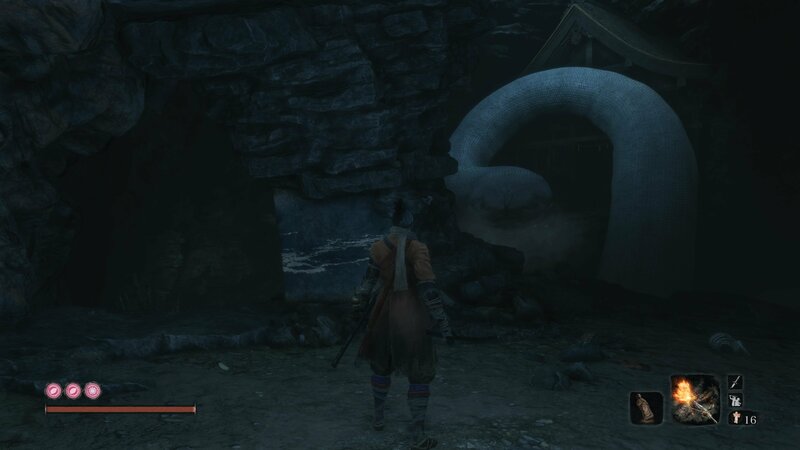 Once you make it to the bottom of the Sunken Valley Passage, you’ll encounter another Giant Snake blocking your path to Ashina Depths. This is actually a separate Giant Snake, and will be met even if you’ve killed the first one. Either way, the Giant Snake in the cave won’t budge and will attack for enormous damage if you try to run or grapple past him. Thankfully there is a way to get past him, but it involves a certain upgrade and some tricksy work. 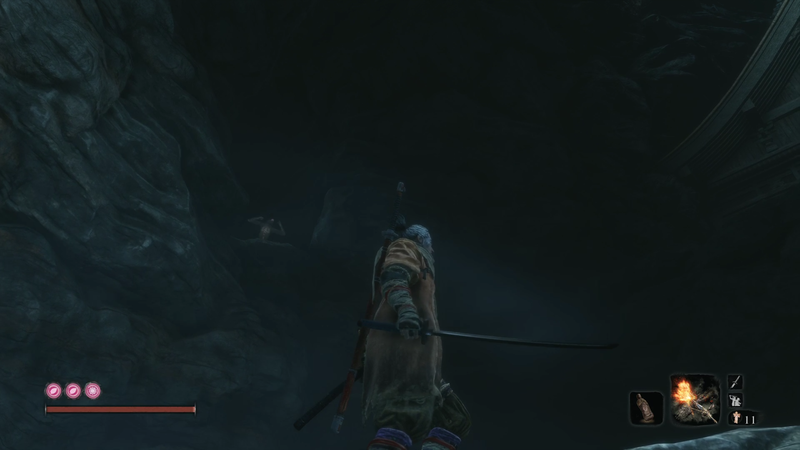 In this guide we’ll teach you how to beat the Giant Snake in the cave in Sekiro: Shadows Die Twice. The Giant Snake in the cave is found shortly after passing the Toxic Memorial Mob merchant in the Sunken Valley Passage. You’ll need to make it past several acid spitting lizards and ghostly wall enemies that pop out with thrust attacks (you can mikiri counter them), but once you know the route, it’s easy to sprint to the Great Serpent. As with other Giant Snake encounters, you need to find a way to slip past unnoticed here, but to do so you’re going to need the Ninjutsu Puppeteer Technique. This Technique is obtained by defeating the Folding Screen Monkeys in Senpou Temple, and allows you to animate the corpses of enemies that you backstab. If you haven’t done so already, defeat Genichiro Ashina in Ashina Castle, then make your way to Senpou Temple to claim the Mortal Blade. You don’t actually need to obtain the Mortal Blade, only defeat the Folding Screen Monkeys, but there’s no real reason not to get it after. Either way, once you have the Ninjutsu Puppeteer Technique, return to the snake, and drop down from the ledge on the left to the platform below. Follow this and climb or wall jump up to the platform with the cowering monkey on it. Don’t worry, you don’t need to stealth here, the snake won’t care unless you get on the platform he guards. Make sure you have the Ninjutsu Puppeteer Technique equipped, then backstab the monkey and activate the technique. The zombified monkey will then leap up into an alcove on the left and begin dancing, drawing the Giant Snake’s attention. As soon as the Snake lunges at the monkey, grapple to the main path and run into the temple here. The Snake’s body will slam into the wall behind you and block the path. Don’t attack it or it’ll slam again, dealing massive damage if it hits. Unfortunately, you can’t actually kill this particular Great Serpent, so you’ll just have to let it go on its slithery way. Inside you’ll find Dried Snake Viscera that can be given to the Divine Child of Rejuvenation during her questline, as well as a grapple point that leads you to the Ashina Depths and Snake Eyes Shirahagi boss fight. 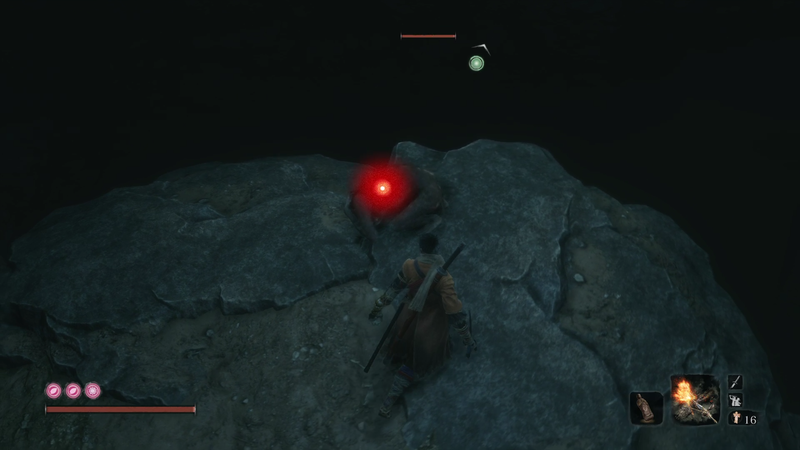 Now that you know how to beat the Giant Snake in the cave, feel free to browse our many other Sekiro: Shadows Die Twice guides for more help finding items and overcoming bosses! To start things off, boost your vitality with our guide to every Prayer Bead location in Sekiro: Shadows Die Twice.